After climbing one of the world's highest mountain peaks in Nepal, Ama Dablana, Dr. Lawrence Draper comes to Montefiore to scale reconstructive and cosmetic surgery. Dr. Lawrence Draper brings to the Montefiore surgical team experience and interests in reconstructive surgery with a focus in microsurgery for the breast, lower extremities, hand, head, and neck. He also specializes in cosmetic surgery of the face and body. 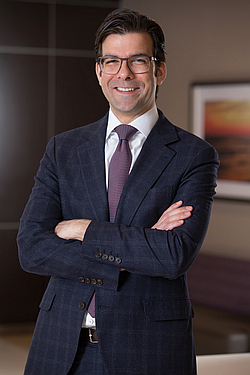 Before joining the surgery team at Montefiore, Dr. Draper was a surgeon in the Division of Plastic and Reconstructive Surgery at Northwell Health System. He has published numerous articles on reconstructive surgery techniques, including breast reconstruction. Dr. Draper earned his medical degree from the University of Rochester School of Medicine. He completed his surgical and plastic surgery residencies as well as a fellowship in plastic surgery at New York University School of Medicine. Originally from Minnesota, Dr. Draper is an avid ice climber and mountaineer, having topped peaks in New Zealand and Canada as well as Nepal.